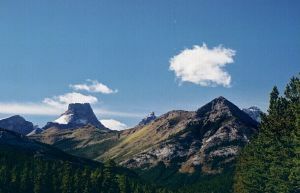 Located SE of Gusty Peak, SW of Mount Kidd South Peak, and NNW of Mount James Walker in the Kananaskis Range. It was originally called The Tower but that was changed so that it was not confused with Tower Mountain. It was re-named in 1957 for its Fortress like appearance when viewed from the N.
It has an impressively steep N face that is approximately 700m high which has at least one route on it. There is also an easy scrambling route up the SW ridge.